"Whatever begins as the site of a cognac distillery will eventually become a Soviet-era publishing house before turning into a Wes Anderson-esque hotel with its own two-floor casino." Ok. It's not a real Georgian saying. But does that make it any less true? 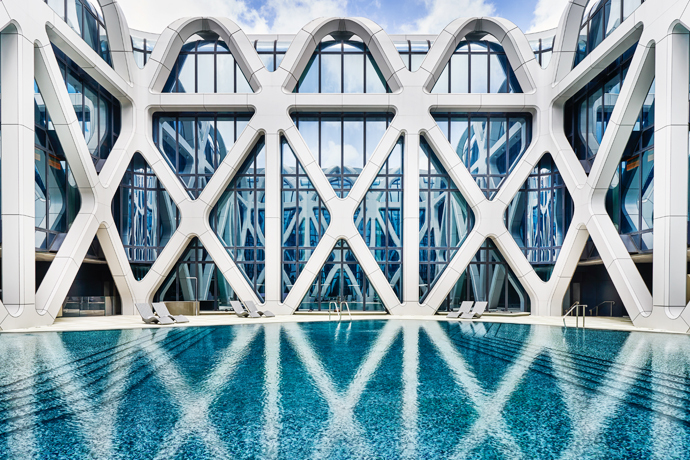 It's an apt description of Stamba Hotel, a cosmopolitan, new 42-room Georgian property dedicated to such pursuits as gaming and rooftop swimming, now open in Tbilisi. This building has had a…. unique history, and it shows. The stark, brutalist exterior from its old life as a printing press remains, but it's been softened by things like a lobby with floor-to-ceiling bookshelves, a rooftop with a glass-bottom pool and a tree-filled, five-story atrium (see the slideshow). And there are enough charmingly design-y details to make even The Royal Tenenbaums director blush, like the freestanding brass bathtub in your room or the café with mint green leather booths and a pink bar beneath an Art Deco chandelier. You and your fashion-obsessed travel companion will take it all in, then explore the cafe's modern take on Georgian fare over lunch and a cocktail before venturing out into Tbilisi's eclectic Vera neighborhood. Later you'll be blowing on each other's dice at the hotel's aviation-inspired, multi-floor casino packed with roulette tables above a steel-paneled underground bar. "Never stay at a hotel with one bar." —Another fake Georgian proverb.